Born in 1829 in Darmstadt, Germany, Kekulé was talented at drawing and mathematics. He followed the wishes of his affluent family and attended school with the intention of becoming an architect. While at the University of Giessen, however, he was most intrigued by Justus von Liebig’s lectures in chemistry. He switched his academic focus to chemistry and studied in France, Switzerland, and England. By 1852 Kekulé had worked in various labs across the continent and earned a Ph.D. from the University of Giessen. Taking advantage of numerous opportunities for advanced study, Kekulé worked in hospitals, universities, and private labs until he began to teach organic chemistry in 1856 at the University of Heidelberg. During the next few years Kekulé turned his attention to the behavior of carbon atoms. He formulated the idea that carbon could be tetravalent; that is, carbon could have a valence of four, which would enable it to bond with both metals and nonmetals. He punished this theory in 1857. Soon after Kekulé expanded on this to propose that in compounds containing more than one carbon atom, the carbon atoms could be joined in long chains. There still remained molecules that did not fit this framework. Kekulé worked on this problem for many years. He used his mathematical abilities and spatial skills to help determine the structure of compounds. One night Kekulé sat doting in front of his fire. As he gazed into the flames, he dreamt that the fingers of fire seemed to become snakes that chased themselves in circles. One even caught its tail to form a ring. When Kekulé awoke, he knew he had the key: certain carbon compounds do not form long, open chains; rather they arrange themselves in closed rings. He worked through the rest of the night and eventually worked out a six ­carbon ring. Published in 1865 this ring structure of the hydrocarbon benzene heralded a new era in organic chemistry. Kekulé continued to study the structure of organic compounds (compounds containing carbon) for the remainder of his life. 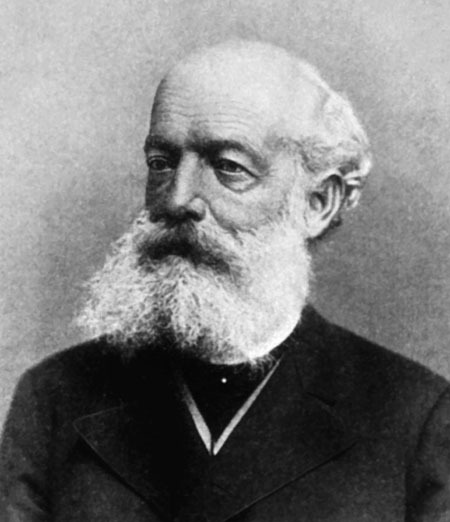 In 1867 he accepted the chair of chemistry at the University of Bonn, where he established a chemical institute. The year before he died, Kekulé was granted a title of nobility, “von Stradonitz,” by the King of Prussia. He died on July 13, 1896, in Bonn, Germany. Kekulé’s discovery of the structure of various carbon compounds enabled scientists to better understand how atoms combine. He can be credited with establishing the field of structural organic chemistry. Prior to Kekulé’s discoveries scientists had been unable to reconcile the behavior of carbon with the current theories of chemical bonding. The idea that an atom could be tetravalent was inconceivable. Kekulé’s discovery changed how scientists viewed the valence of carbon, that is, the property of carbon that indicates the number of other atoms it can bond with. He instigated another shift in thinking when he proposed that molecules could have structures that were nonlinear; all organic compounds up to that time were seen as long chains. His ring structure was a radical idea. It literally changed the shape of chemistry and became the foundation of modern organic chemistry. Although Kekulé was not able to directly test his theory, current experimental techniques support his findings. Today the field of organic chemistry has expanded on the ring theory of Kekulé. It is used to examine the structure of other non­linear molecules because it provides an accurate model of how molecules are spatially arranged. This is integral to today’s research with complex carbon molecules. As scientists continue to explore coal­ and petroleum­based compounds and how to synthesize them, Kekulé’s insight into the structure of organic compounds has proved invaluable. Posted on March 8, 2015 by Natalie. This entry was posted in Chemists. Bookmark the permalink.